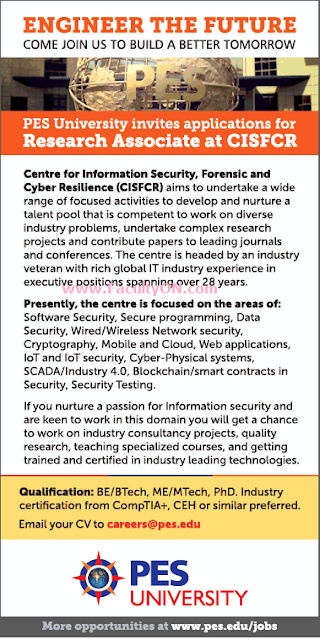 PES University, Bangalore has advertised in THE TIMES OF INDIA newspaper for the recruitment of Research Associate jobs vacancies. Interested and eligible job aspirants are requested to apply immediately from 25th July 2018. Check out further more details below. College University: PES was established in 1972 at Bangalore, the Silicon Valley of India. PES is focused on four main educational areas: Engineering, Medicine, Management and Life Sciences. The institutions offer both foundation courses in these areas, as well as specialization with a Bachelors/ Master/ PhD Degree. How to Apply: Interested and eligible candidates are requested to apply to the email ID given below.